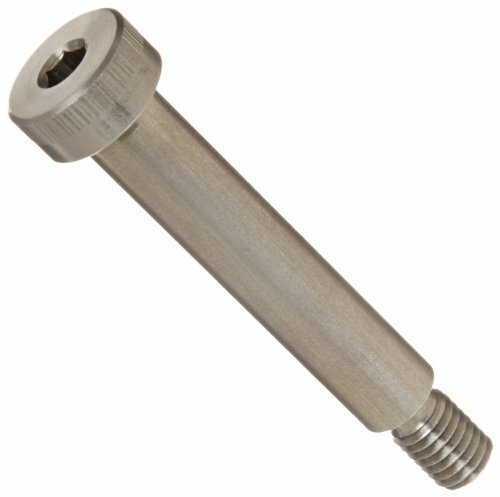 The 18-8 stainless steel shoulder screw has a plain finish and a socket cap head with a hex socket drive, meets International Organization for Standardization 7379 specifications, and is made in USA. The 18-8 stainless steel material provides strength and offers good corrosion resistance in many environments. The material may be slightly magnetic. The socket cap head is round with a flat top and a high profile that provides high strength, and installs using an internal drive system that enables more compact spacing than a hex head cap screw. The hex socket drive has a hexagonal slot that requires an Allen key driver, also known as a hex key or Allen wrench. Shoulder screws, also known as shoulder or stripper bolts, have a smooth unthreaded shaft that acts as a spacer or bearing surface between the threaded portion and the screw head. Shoulder screws with round shafts are commonly used for items that require rotation, while those with square shafts are typically used to lock into place and prevent rotation.